I haven't written much lately, either in these emails or on my blog. I've been on the road a lot, often in places without great Internet access. Also, I've reached the point in life where I prefer being present in the moment to appreciate new experiences and enjoy quality time with friends as much as possible, so I've intentionally tuned-out a lot. Even though I haven't communicated directly much recently, I have been busy online. 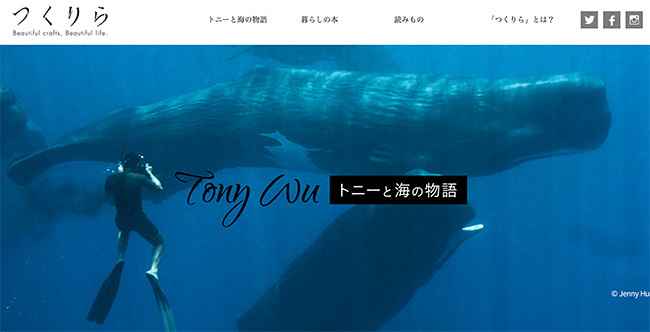 At the urging of friends about a year ago, I re-activated a long dormant account at tony-wu.com and set my mind to creating an online portfolio. Given travel, year-end is the only time when I can set aside blocks of time to focus on projects like this, so this was my year-end 2017/ year-beginning 2018 effort. Check it out if you haven't seen it already. Earlier this year, I also started writing an online column about marine life and conservation issues in Japanese for a publisher in Japan. As of now, I've posted 11 installments, with a new one scheduled to go up every two weeks, for an initial run of 24 total columns. Japanese is not my first language, but I can communicate reasonably well. Writing is considerably more difficult than speaking though, as is the case in any language. So...get ready for this...I am writing the text in English, but I'm thinking in Japanese when I write, because the language structures are not parallel. How you express a concept in one language may or may not bear any resemblance to how you do in the other. When the thought structures happen to coincide, it's easy. When they don't, as is often the case, the challenge is to write in a way that I believe will translate well into Japanese. I am fortunate to be working with a super-talented and dedicated translator who gets most of what I write. She's also taking a genuine interest in the topics. I can see that she is researching and learning along the way, as well as contributing valuable suggestions. I am grateful and indebted to her talent and dedication. Thank you Kato-san! The publisher's audience is primarily young- to middle-aged women. The publisher does not specifically target divers, photographers or conservation people. It is entirely possible that some of their audience falls into these categories, but my goal is to open the eyes and minds of people who aren't already on side. Also, I am writing in a way that is easy enough (and hopefully also entertaining enough) that kids will enjoy the stories as well. I hope to reach kids through these adults. The column is in Japanese, so chances are you won't be able to understand the text. But please take a look if you're interested, and please forward to any Japanese friends you might have. Why am I going to such trouble? My goal with this project is to reach out to audiences beyond the obvious ones. Some of you may have heard me rail about the comparative lack of value of continually "preaching to the converted," so to speak. It's easy to post to social media sites and get approval/ agreement from like-minded people. The question is: How does that address/ change the world for the better? Doing so is not entirely useless, but it's pretty easy. There is no challenge to easy. Think of a way to address people who don't already know about or necessarily agree with conservation issues, people who either don't have the relevant information/ experience, or people who could benefit from seeing evidence and listening to reason. C'mon! Let's change the world, each in our own areas and ways. Not because you want a slew of Likes, but because it's the right thing to do.